First of all, it is completely impossible to describe my Fulbright experience in few pages or in hundreds of pages. The reason is simple. Imagine that you have never tasted chocolate. You can read a bunch of books about chocolate, know the recipe and the smell of it, write a dissertation about it, but if you have never tried it, you will never know what actually chocolate is. Thus, even though I will try to do my best in these pages, I do not have enough words to explain it to anyone. The most important reason why I have applied for the Fulbright, of course, was my research. This experience exceeded my expectations. I have done a lot of interviews (for the record and off the record, formal and informal) with think tank experts and governmental officials (the Carnegie Endowment for International Peace, the Brookings Institution, the Department of State, to name a few). However, the most memorable interview for me was with an expert from the Washington Institute for Near East Policy. We had to reschedule our meeting for 4 times. I have to admit I was upset about that. One time I was already close to the Institute when I received a message from his assistant that we have to reschedule. Again! It was more than an hour distance for me to go to the Institute with an awfully slow Washington’s public transport. I thought that this man was probably very arrogant or something and, at the same time, I was justifying him: “Well, he worked with Madeleine Albright and John Kerry, so he probably has a right to be arrogant.” But when I actually have met him, it was a good lesson for me. He was so humble, he apologized to me like dozens of times for the rescheduling and gave me sincere, smart answers to the interview questions. I felt incredibly inspired on that day and embarrassed that I was thinking like that about this intelligent man. Another interesting experience for me was the bond that I have made with my host university, American University (AU) and, especially, School of International Service (SIS). I was introduced with hard-working and talented doctoral students by my advisor Prof. Boaz Atzili. He was so kind while helping with my project and now our academic relationship continues. One of the memorable meetings at AU was the first consultation with Prof. Patrick Thaddeus Jackson, who is also an Associate Dean in SIS. While I was waiting for a meeting with the professor, I saw the quote on the wall: “It is a mark of an educated mind to be able to entertain a thought without accepting it” Aristotle. I thought to myself that it could be any university’s primarily goal. After an hour of talk with the professor my first thought while walking out of his office was: “Oh my, this man knows how to entertain a thought.” He is a fabulous, creative and sharp-minded academician. I was privileged to attend doctoral seminars of Advanced International Theory that was taught by him and Prof. Ann Tickner. This class expanded my knowledge on theory. I have started raising questions that I have never even thought about. Those questions I have also discussed with another extraordinary professor, Associate Dean Rosemary Shinko, who is a well-known theorist in International Relations field who gave a lot of advice for my research. Working on my dissertation for hours in the library was also a part of the experience. Maybe not the most fun part but, still, a very important one. The vision of my dissertation has changed, including the title which now is „The Nexus between Knowledge and Action in the U.S. Foreign Policy: the Role of Think Tanks in the Construction of “the Middle East”. Many new ideas floated into my dissertation after hours of work. Another thing that I have to discuss is, of course, a very important mission of every Fulbrighter which is being an informal ambassador of your country. Spreading the knowledge about Lithuania was sometimes not planned in advance. Talking with strangers actually was a big part of it. Everyone knows, that academicians and doctoral students or master students are already knowledgeable people. Most of the time they know at least geographical location of Lithuania. On the other hand, people that start to talk with you on the bus, in the coffee shop or gym are not always that well introduced with World’s geography and cultures. I will give you an example. I was attending a gym close to my home and most of the time I was wearing Lithuania’s national basketball team’s T-Shirt. On purpose. It was actually my roommate’s advice who thought that it would be a good way to spread the knowledge about Lithuania. So, it was a number of people who asked me about the T-shirt and that is how they were introduced to Lithuania and its people. On the flip side, I was surprised several times about people’s knowledge on Lithuania. For instance, I have met an Alumni from AU who is from China and he is learning…Lithuanian! Another person that I have met on the metro was asking me about the political situation in Lithuania and what is the state of Lithuania’s democracy. Being an informal diplomat of Lithuania was a fun and rewarding experience. Other experiences like volunteer day with other Fulbrighters, having a coffee with them seemed like a natural part of it but talking with Americans and people from around the Globe who were curious about Lithuania was a very pleasant surprise for me. There were more surprises that are very precious and personal to me like going to the concert where the guitarist played who inspired me to play the guitar few years ago. After the concert I was not able to sleep all night because of the excitement. Those moments probably I will remember till the last day of my life. In my personal statement while applying for this program I wrote that everything started because of the TV series the West Wing. While visiting memorials and having a tour in the White House and recognizing all the places that I have seen in this show, I was reflecting about how much I have changed since then. The Fulbright experience was like living in my teenage dream. So, here I am (What is that song?… “Here I am, this is me. 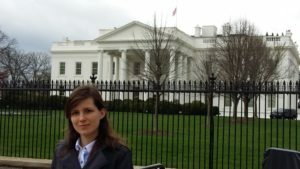 There’s nowhere else on Earth I’d rather be…”): a girl who had nothing as a kid (sometimes even what to eat) is walking in the White House, shaking hands with people who contributed to the world’s history like Zbigniew Brzezinski or some others that I have seen in various think tank events. I wish that everyone could feel this sense of achievement. In some regards, it was a challenging academic year. It was hard physically (I was super skinny and tired most of time) and psychologically, when I was missing home and my loved ones so bad that I wanted to buy tickets back to Lithuania. However, this sketch of my Fulbright experience demonstrates that this program is an opportunity to find your strengths that you have never noticed while being in your comfort zone. I encourage you to apply and share your Fulbright experience because, I bet, it will be different but still the one of the best adventures in your life. For other countries’ citizens check out a website of the U.S. Embassy in your country.